potluck (pŏt'lŭk') 1. (n.) Whatever may chance to be in the pot. 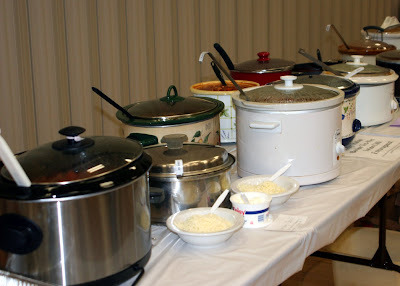 Tonight we had a chili cook-off and preparedness fair at our church. My mom and I made a "Southwest Chili"- it comes from the kitchen of Shawna LeSueur who got it from her friend Becky. I liked it so much I wanted to share. Combine turkey, onion, celery, and pepper. Cook together until turkey is done. Add remaining ingredients and cook in pot for 2 hours or crockpot on high. That sounds good. I didn't try it because I didn't know it was yours. You did a great presentation at the Chili Cook Off, you always present yourself so well. I hope you have a blast with your mom!